Jim Farris, a native Houstonian, with a background in Fine Art, started his own custom cabinet shop, “Jim Farris Cabinets” in 1976. He offers a gamut of woodwork using domestic and exotic woods, veneers, and laminates. This Mid-Century Modern Ranch home is full of cabinets and furniture by Jim Farris Cabinets. It was featured in Houston House & Home magazine (link below). Throughout the house our creativity and skills were challenged. The end result was an updated modern home and furnishings in keeping with the original architecture. This was our second project to work on with the Cobens. I feel truly blessed to get to work on projects like this one! Be sure to scroll through all the photos from this project. This custom wine room features our white oak cabinetry, slate on walls, floor and counter, climate control and LED lighting. The stained oak is finished with ML Campbell Krystal (a post-catalyzed conversion varnish). Each vertical row will hold a 12 bottle box with 1 bottle on display. Each and every piece is hand sanded (a real rarity in today's market). The center cabinet is backlit for special effect. 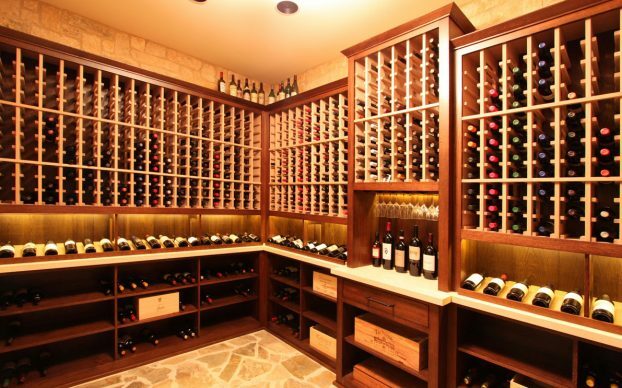 It has a total capacity of over 1,300 bottles. In my 40+ year in business, I have never worked on a project that was more of a collaborative effort. 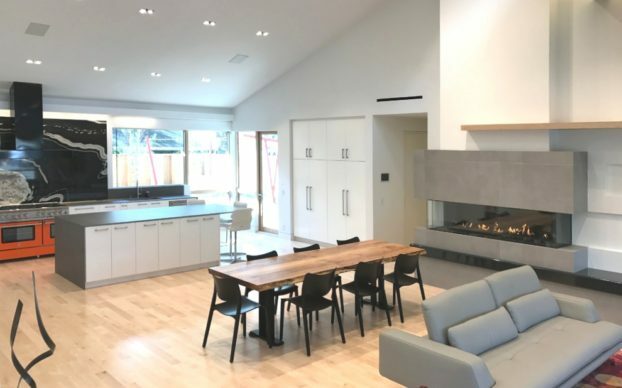 The home owners, the builder, the architects and us at JFC all worked together harmoniously from beginning to end to make every detail on this home just perfect! I'm sure you have heard the saying, "Less is More". That really sums up this project! I have to tell you that the simplest looking details on this project really stretched my design and engineering skills. As you scroll through the photos of this project I hope you can appreciate "Less". The contrasting colors and textures make this contemporary style kitchen quite stunning. 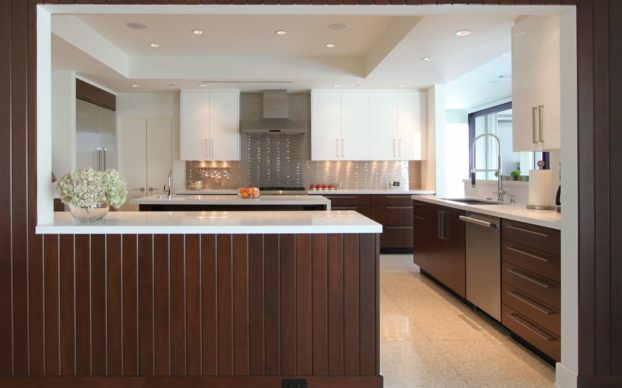 Figured maple veneers, black granite, white marble, stainless steel, ebonized oak, and stained concrete are just some of the high-end finishes that really make this kitchen pop! We actually built this kitchen twice, once before Hurricane Ike, and once after. When my client told me that they wanted to redo their control room that I designed over 15 years ago, I was excited. Their main goal was to increase their WOW factor. 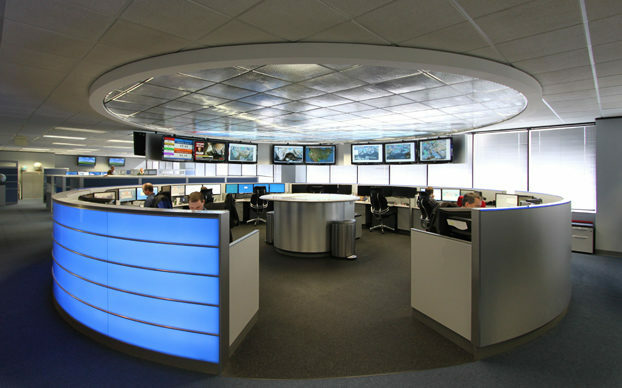 This circular control room is 27' in diameter and is made up of 10 separate workstations, which are staggered with 4 monitors apiece. The overhead monitors and overhead curved walls are suspended from the ceiling. There are lots of eye-pleasing materials to be explored here! Also included is a plan drawing that shows the complexity of the layout. Doesn't it say WOW? You be the judge. 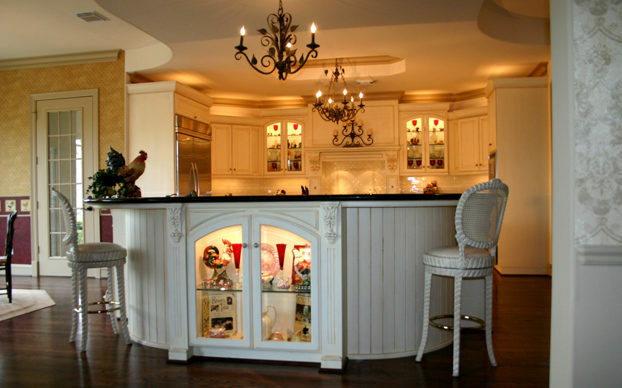 This French-Country styled kitchen features a custom catalyzed glazed finish and black granite counter tops. 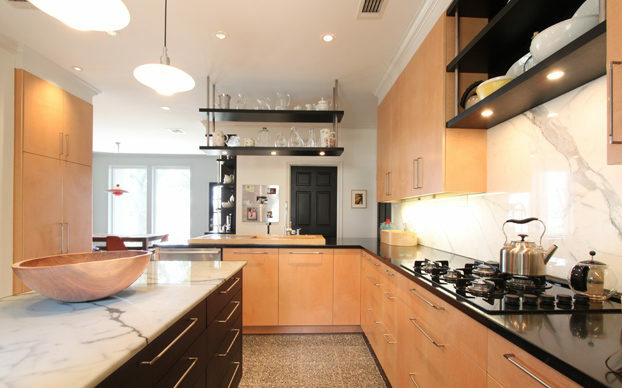 The kitchen incorporates two islands whose shapes are mirrored in the ceiling fur downs. The dramatic kitchen lighting makes for an extraordinary effect in the day or night. The fine woodworking details are displayed even more in the following photos. A lot of thought and planning went into every detail in this beautiful kitchen.